The website for the 2016 National Conference on Higher Education in Prison at Belmont University is now live–nchep2016.com–head over there and check them out! You can also follow NCHEP 2016 on their Facebook page. 8-10:15: William Pitt Union, 3959 5th Ave.
10:45-12: 1 session in WPU; 4 sessions in Cathedral of Learning, 4200 5th Ave.
12-1:15: Pizza lunch at Cathedral of Learning, G24. We suggest you take your lunch up to the first floor, where there are plenty of tables and nooks. Table session in 335 & 349. 1:15-2:30: 1 session at Lawrence Hall 120 (where we supped); 4 sessions Cathedral of Learning. 2:45-4: All sessions at Cathedral of Learning. 4:15-5:30: All sessions at Cathedral of Learning. 5:45: Meet for buses to Chatham at Bigelow, William Pitt Union side of street, near bus shelters. First round pick up at 5:45; second round ca. 6:15. 6:30-10: Reception/Discussion at Chatham University, Buhl Atrium. Navigating the Cathedral of Learning will require patience. Our classrooms are distributed across three floors: the ground level (G24, G13); 2nd floor (208B); and especially 3rd floor (324, 352, 358, 363). You will enter on either the ground floor (from Forbes) or the first floor. There is a bank of elevators in the center of every floor, and eight stairwells to accommodate ascents and descents. The breaks between concurrent sessions Saturday afternoon are short. We ask in advance for your patience with moving between them. Consider “rehearsing” the navigation to your presentation space in advance of your presentation, if possible. Tonight at Chatham University, Buhl Atrium, 630-10. Attendees will board buses outside the William Pitt Union on Bigelow, by the bus shelters, at 5:45 pm. The first buses will leave at 5:45, and then return for a second pickup (we would guess 6:15 pm). Buses will return attendees to the William Pitt Union. There will be a short walk from the dropoff location (5th and Woodlawn) to Buhl Atrium on arrival. Please make your way quickly to the bus pickup following 4:15 (end 5:30) panels! Link to National Organization Survey! Welcome to Pittsburgh! Thank you for coming all this way to join in conversation. This update summarizes the conference schedule and locations; reminders about weather, dress, and walking between conference locations; registration times; table locations; notes on food; our contact information—we hope, everything you need to know in order to find your way to everyone else. Conference hotel shuttle services the Phipps Conservatory and University of Pittsburgh. Ask at the desk about times and procedures. Plenty of parking at the Phipps. To park at Pitt, we suggest Soldiers and Sailors parking garage at 4215 5th Avenue. You’ll need to navigate the flora. From the front entrance, take stairs or elevator up to the main floor. Staff at the conservatory entrance will direct you to Special Events Hall. Use the entrance on Forbes. Rooms 120 and 121 are just past the common area. From main entrance, head left toward hallway. Room 125. Main floor. From the entrance on Fifth, turn right, pass the information desk. Navigating the Cathedral will require patience. Our classrooms are distributed across three floors: the ground level (G24, G13); 2nd floor (208B); and especially 3rd floor (324, 352, 358, 363). You will enter on either the ground floor (from Forbes) or the first floor. There is a bank of elevators in the center of every floor, and eight stairwells to accommodate ascents and descents. The breaks between concurrent sessions Saturday afternoon are short. We ask in advance for your patience with moving between them. We suggest “rehearsing” your navigation to your presentation space in advance of your presentation (or panel moderation), if possible! We hired buses for this event. (The buses are not fancy.) Two trips depart: the first at 545; the second at 615. Return: 9 pm and 10 pm. Pick-up and drop-off on Bigelow, the William Pitt Union side of the street, by the bus shelters. As you see, there will be much of this (in various senses, ideally). We hope that movement will not only keep us hale, and alert, but also that the short walks may occasion meeting someone nearby. Distances between buildings are noted in the program. On Friday we will have one ten-minute walk (.4 mi) and one five-minute walk (.2 mi). Let us know if you have any concern about transit. Today rain is predicted. Consider bringing an umbrella; comfortable shoes; and layers. Please feel free to bring your materials to the Phipps on Friday. Saturday, tables will be set up from 10:45 a.m. to 6 p.m. at the Cathedral of Learning in two rooms: 345 and 349. There will also be table space at the Saturday evening Chatham reception. While you are with us, your meals will be taken care of, but you might wish to bring snacks or additional provisions. Friday notes: 1) breakfast is light. The Phipps café opens at 10 a.m. if you’d like something more substantial before lunch. 2) Friday’s boxed lunch takes dietary restrictions into account; if you are not vegetarian or vegan, we ask that you kindly leave these options for those who registered the preference. For food on your own, numerous options on Forbes Avenue (Red Oak Café, Pamela’s Diner) and Craig between Forbes and Fifth (Ali Baba, Bagel Factory, and the Union Grill). Conference updates–one month to go! Hello all! We wanted to share some updates about the conference as we work to finalize our program*. Update topics covered in this post include plenary speakers, our Thursday evening kick-off event, lodging and travel, table space at the conference, and registration and donation. We look forward to seeing everyone in Pittsburgh next month! As always, please share any questions with us at nchep2015@gmail.com. We have a wonderful, challenging, and informative slate of plenary speakers, divided across six all-conference sessions on Friday, Saturday, and Sunday (four sessions on Friday, and one each on Saturday and Sunday morning). Check out a list of all of our confirmed plenary speakers to date on our conference schedule page. We’ve also started to keep a running list of organizations, people, institutions, and academic units who have contributed labor or financial support to make our conference possible. Please refer back frequently to our thank you page as this list continues to grow! On Thursday, November 5, at 5:00 pm, we will be hosting a community kick-off event at the beautiful Phipps Conservatory Special Events Hall. We have an exciting line-up for this event (which will feature discussions about anti-incarceration justice work with youth, scholars, and community activists in a town hall setting) that we’ll be able to post details about shortly. If you’re interested in attending, please let us know on your registration form. The block contracts at the Wyndham (deadline: October 9) and Hilton Garden Inn (deadline: October 12) both expire in less than a week. If you plan on making a reservation in one of these blocks, we encourage you to do so as soon as possible. If you find an affordable hotel option and would like to talk with us about bus routes and other means of reliable access to conference events, feel free to send us an email–we want to help however we can. If you have applied for conference travel support, we will be in touch with you soon about the amount that we can offer at this time. We are fundraising constantly so that we can give as much as we can. The best way for anyone to help us in this effort is to register with a fee, or make a tax-deductible donation (be sure to check “Prison Education Conference Fund”) to the conference. Go to our donation and registration page for more information. 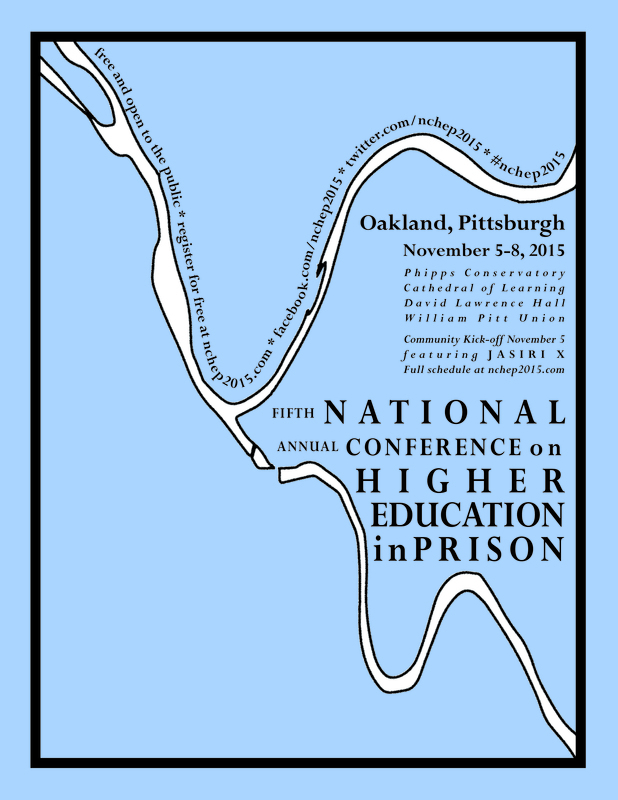 If you would like to request table space at NCHEP 2015 to distribute or solicit information related to your institution or organization’s education in prison and/or anti-incarceration justice work, please let us know as soon as possible at nchep2015@gmail.com. We’ll do our best to accommodate everyone’s requests–and we hope that conference information tables will be a great way for people to connect and reconnect with some of the wonderful work everyone is doing in different parts of the country. Our registration numbers look great! If you haven’t already registered (thanks to everyone who has!) we want to encourage you to do so as soon as possible, and we do ask that all conference attendees register by October 18. Please go to our donation and registration page for more information. As a reminder: while there is no cost to attend our conference, your choice to register with a fee, or to register with no fee and separately submit a tax-deductible donation, will provide vital assistance toward our goal of making NCHEP 2015 as accessible as possible. You can access any of our registration or donation pages directly from the links to the left of this post. *we do appreciate your patience with this process as we work to fit live videoconferencing events from around the U.S. into our schedule. Announcement From the 2016 Conference Host! The Tennessee Higher Education Initiative (THEInitiative) is pleased to announce that Belmont University has agreed to partner with our organization in the hopes of hosting the 2016 National Conference on Higher Education in Prison for November 3–6, 2016 on its central Nashville campus. THEInitiative is a Nashville-based 501(c)(3) that works in partnership with colleges and universities in Tennessee and the TDOC to provide access to degree-bearing higher education in the prisons. Since its founding in 2012, THEInitiative has primarily worked with Nashville State Community College by funding and coordinating on-site college programs at two medium security prisons in the greater Nashville area. Belmont University has also had presence in prisons in Nashville through its work with Janet Wolf and the Inside-Out program and more recently the many professors who teach in the THEInitiative college program as adjunct for Nashville State. The conference will be sponsored by the THEInitiative and Belmont University’s Colleges of Health Sciences, Theology and Christian Ministry and Liberal Arts and Social Sciences. Belmont University and THEInitiative are working on solidifying funding for the conference and, barring any extraordinary circumstances, look forward to bringing the conference to Nashville and the Southeast and its unique culture of social justice and activity in mass incarceration. Online donation is now live! Our online donation procedure is now live. Donations are tax-deductible–you will receive a receipt directly from the Pitt Office of Institutional Advancement (100% of your donation will go to support the conference). Please go to our donation and registration page for information on how to donate and register to the conference. If you make a donation, and also plan on attending, we still ask that you fill out our registration form–you can do this from our donation and registration page, or by using the links on the right sidebar. There is no cost to attend our conference–but if you are able to donate, or register with a fee, we can’t thank you enough for helping us to make this conference as accessible as possible. Stay tuned on this space for exciting updates about the conference schedule and program, plenary speakers, and more. Looking forward to meeting everyone in November!